Securis’ dedication to its community mission provides secure electronics recycling for Lowe tenants in a way that does not harm the environment. Lowe understands that providing a green alternative to the computer recycling dilemma empowers community members to reduce their personal carbon footprints and is providing a free recycling and data destruction event for all Park Center tenants in the loading dock area between 4401 Ford Avenue and 314 King Street on April 24th from 10:00 am to 2:00 pm. Securis processes just about anything that plugs in. See our List of Acceptable Items for more information. Note: We will be accepting all monitors and televisions as well. Our security technicians will be located within the building’s parking lot. If you have equipment in your office, please feel free to bring it to the loading dock. If you have equipment in your car, please pull into the loading dock so our team can assist with unloading. Should a single piece of equipment exceed 200lbs in weight, please let us know so that our security technicians can assist you in its transportation to the loading dock. Securis will be offering documentation certifying electronics recycling and data destruction services at this event. Just leave your e-mail address with the Securis staff and they’ll email you a Certificate of Recycling and Destruction. 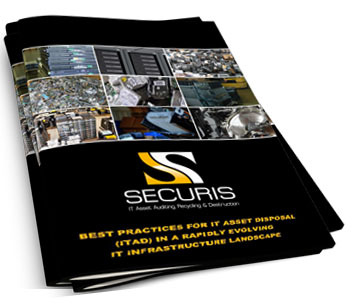 At Securis, 100 percent of each electronic asset entrusted to the firm is recycled. Absolutely nothing is left to be disposed of in a landfill. All recycling is processed domestically to ensure the highest level of security for your organization. Securis does not export any electronics to developing countries or non-OECD countries. Securis believes that the decision to recycle can easily become the cornerstone of any organization’s larger green initiatives. It is a natural extension of global responsibility that illustrates your organization’s dedication to a better tomorrow, and can be a value-added marketing tool that inspires a different level of confidence from your customers, partners and affiliates. This event will be offering hard drive shredding and degaussing. A trained Securis technician will remove the hard drive from your computer, laptop or server while you watch. The hard drive is then dropped into our industrial shredder and ground into small pieces. The process only takes a few minutes. You will leave with the peace of mind that your information is gone forever. Securis employs an HPM-1 Degausser which guarantees that data is completely erased. The HPM-1 degausser’s listing in the NSA DEPL guarantees you that your data is completely gone and will not end up in the wrong hands. Certified by the Defense Logistics Information Service to handle classified, mission critical military data, Securis is one of the first companies to receive R2 and NAID certification in data destruction including complete compliance with every federal, state and industry regulation. Securis’ data destruction services are for effective management of any organization’s data storage assets and are designed to meet or exceed all National Security Agency (NSA) requirements. We provide the highest standard of service to all federal, state and local Government agencies, as well as corporate entities wishing to responsibly and permanently destroy all data storage devices. Data destruction methods are in compliance with National Institute of Standards and Technology (NIST) Special Publication Series 800-88. If you have any additional questions concerning this event, please feel free to contact your Securis representative, Michael Stegeman at 703-436-1967.